Something you ought to know: A new addition to the Move Over/Slow Down law went into effect Sept 1. 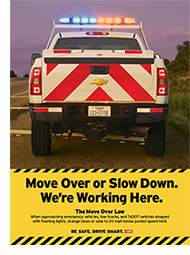 The law which requires motorists to move over or slow down for emergency vehicles on a roadside stop now protects TXDOT workers too…Texas drivers must move out of the lane closest to TXDOT and emergency vehicles with lights activated when possible, or slow down to 20 mph below the posted speed limit. Violators face a fine of up to $2000. YIKES!